The Craigellachie Bridge is a popular tourist attraction in the region and has even been featured on a Royal Mail stamp. However, the structure, which was designed and erected under the direction of Thomas Telford, is in need of repairs due to the metal in some parts beginning to rust which could lead to the stonework becoming loose. 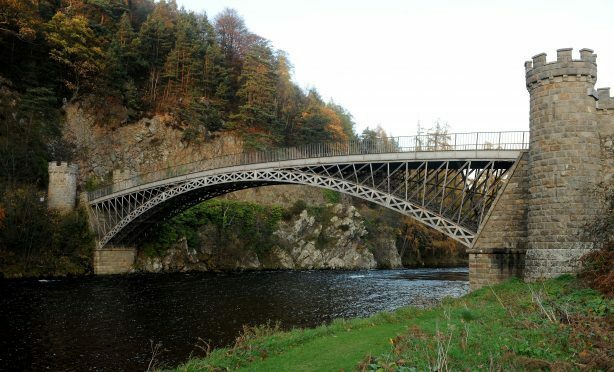 The Friends of Craigellachie Bridge charity was formed to raise funds for the £450,000 restoration project to preserve the striking structure for future generations. However, the group of enthusiasts have struggled to find funding streams because they cannot ascertain who actually owns the bridge and Moray Council has been asked to review its own records to try and establish ownership. Campaigners have now held “positive talks” with the local authority and submitted plans to them that outline exactly what they want to do with the crossing. Legal issues will now have to be worked out before the council can decide whether the group is granted a 25-year lease for the bridge. Mike Middlehurst, a member of the Friends of Craigellachie Bridge, hailed the meeting as a big milestone but warned that it may take a long time for them to put their plan in place. He said: “We want to repair the bridge on both approaches either side of it but that will cost a substantial amount of money. “What we hope happens is now the council have full knowledge of our plan we can reach an agreement with them to lease the bridge and then we submit some applications to get funding. Donation boxes have been installed at the bridge for visitors to give money to support the cause. The charity will hold its annual general meeting on April 2 at 7pm in the tennis pavillion at Craigellachie for anyone keen to become involved in the campaign.